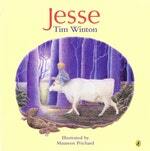 This is a warm, touching story of a child encountering the mysteries and marvels of the countryside. Early one morning, while his parents are asleep, Jesse slips on his gumboots and goes outside - through the garden, past the fence, and out to explore the friendly, frightening world beyond . . . This is a warm, touching story of a child encountering the mysteries and marvels of the countryside. Love Jesse? Subscribe to Read More to find out about similar books.